Christmas cards have been a part of our Christmas traditions for well over a century. They bring wishes of joy and health to those we know and love. Christmas cards give us the opportunity to honor our intentions to "keep in touch" with an old friend or relative. They bring joy to those who receive them, not just because of a beautiful illustration or inscription, but because they all say, in intent, "you are thought of". Although many early Christmas cards have a strong German influence, the invention of our modern day Christmas card can be deemed an essentially English invention. New Year's greetings date back as far as the 1400's, but printed Christmas greetings developed later. The card shown here was printed circa 1850s. The use of these cards dwindled over the next two centuries. 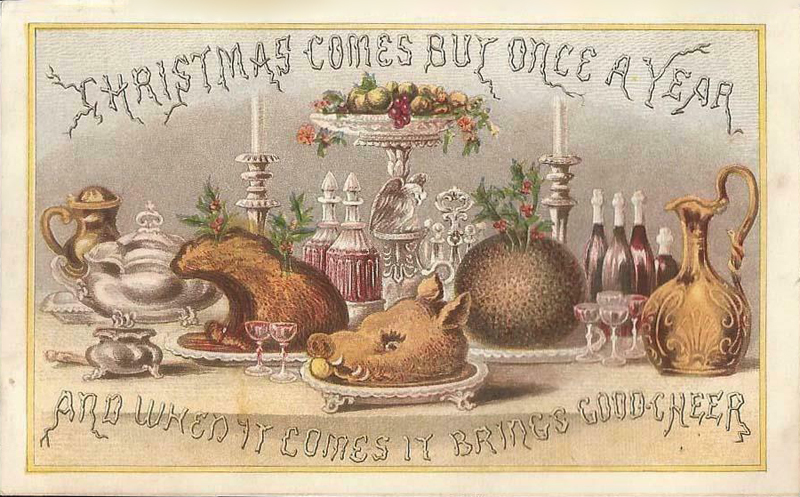 Then in the eighteenth century special printed items were made to be given out during the holidays. The first holiday greeting cards were probably the "Christmas Pieces" made by students in the early 18th century. Grade-school students would take large sheets of writing paper, printed with engraved borders, and write messages to their parents expressing holiday greetings. A child might write a message such as "Love to Dearest Mummy at the Christmas Season" or "Holiday Wishes to Aunt Agatha and Uncle Fred." These samplers were designed to show their parents how well their handwriting improved over the past year. By 1820 color was added to the engraved borders, making the pieces much more decorative. The use of note paper with matching envelops, both with decorative designs printed on them, was another early custom. The invention of the Christmas was an natural progression from these Christmas traditions and the customs associated with Calling cards, Reward of Merit cards, and Valentine cards. The sending of seasonal messages of goodwill is an ancient custom, dating as far back as pagan times. The celebration of the new year was one such event. Back then, good luck charms were exchanged at the winter solstice. The advent of a wood-block printed New Year's cards came around the fifteenth century. By the eighteenth century New Year's cards were being produced for tradesmen to send to their customers. This custom, however, was not employed by the general public until about 1770. Charles, Duke of Orleans, is generally credited with being one of the first people to write verse in a way associated with Valentines. In 1415 he was imprisoned in the London Tower where he spent many hours writing "poetical or amorous addresses" to his wife in France. One even included a drawing of a Knight and a Lady and Cupid shooting his arrow into the Knight's heart. A century later the writing of Valentines had become a very popular custom. In the seventeenth century people made their own Valentines with either their own verse or a poem borrowed from a published source. The first manufactured Valentines appeared around 1800 and were of very simple design. By the 1830's Valentines were being made of fine papers and decorated with satin, ribbon, or lace. They had pictures of turtledoves, lovers' knots in gold or silver, bow and arrows, cupids, and bleeding hearts. The verses were also very delicate and artistic. In the 1840's the first mechanical Valentines were marketed to the public. The custom of sending a greeting in a card had become a deep rooted tradition. As we will see, this would lead to the development and custom of sending greeting cards at Christmas time. Victorians had a passion for collecting beautifully printed cards and scraps for their parlor albums. Trade cards, issued by merchants to advertise their products, were highly collectible by the 1870's. These cards evolved from the trade cards that were given out by tradesmen in the late 1700's. In the early 1800's trade cards started becoming included with a purchase of such items as coffee, tea, soap, tobacco, and food items. Families looked forward to receiving their free card with their purchase. With the coming of quality lithography these cards became cherished prizes. Many have Christmas themes with images of Santa Claus, Christmas tress, snow covered landscape, and children with toys. These sound like Christmas cards. In fact, some trade cards were also reprinted as Christmas cards but replacing the advertisement with a holiday greeting. Getting a beautiful card for free and pasting it in the parlor album was a delightful experience. The same would be the case when families started receiving Christmas cards each year later in the century. Robert Raikes, the founder of Sunday School in 1780, introduced a system of rewarding students in order to maintain discipline, good behaviour and attendance at his Sunday school. He would issue small chromolithographed "Reward of Merit" cards to a deserving student who would in turn take this prize and paste it into a scrap album where it could be viewed at family gatherings to show his accomplishments at school. These cards began with very simple designs and only one color, but over time, developed into beautiful cards that rival Christmas and Valentines. 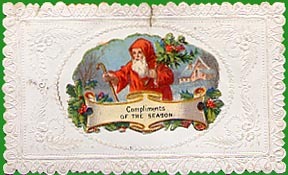 Just like the trade cards, some Reward of Merit cards were also reprinted with a holiday greetings at Christmas. Embossed Christmas calling card with a Santa scrape glued on that reads "Compliments of the Season"
The custom of using calling cards began in France sometime in the early 1800's. This practice spread throughout Europe and came to the United States in the mid 1800's. Callings cards, also known as Visiting Cards, were carried by the well-to-do of society and were presented at the time of a social visit. They were often left in special calling card receivers (trays) which was set on an entry table or parlor center table. The cards were smaller than today's business cards, frequently consisting of a name engraved and printed on glossy stock. In later years designs became more elaborate incorporating hearts, doves, scrolls, and forget-me-nots. The receiver of such splendid cards would often paste them in the family scrap book. Again, a tradition of exchanging cards was leading up to what would one day be the exchanging of Christmas cards. I'm sure Sir Henry Cole had received his share of Calling cards. The History of Christmas Cards website is based on the findings of Greg Livaudais using his collection and many published sources. All the cards illustrated are from the G.Livaudais Collection. This collection contains about 10,000 Christmas cards dating from the 1840s to current. Much of the text on these pages come from the study and analysis of the cards in this collection. The source of other information is noted in the bibliography on the last page. You can find many websites devoted to Christmas themes, some including sections on Christmas cards. I encourage you to visit these sites, but I think you'll find The G.Livaudais Collection one of the most comprehensive Christmas Card sites on the web. In fact, there are many sites that have "borrowed" not only my images but even my text, and word-for-word on some websites. Some websites do include information not contained here. So 'surf' around, but if something you read out there sounds familiar, you'll have a good idea where it came from. Card count: 285 cards displayed on this website.